According to a recent survey, most of the fresh graduates from colleges, like around 70% of them expect to earn more than the previous year out goers. BPO is an industry which has a great career option for a fresher in terms of salary as well as knowledge gained. A good degree with excellent communication is a common thought among the freshers to enter into BPO. Even though this might seem partially right, presently it requires good skills as well as more smartness for this field. For that provided here few BPO interview questions and answers. 1. Questions related to field knowledge. 2. Questions related to personal interest. The interview process of every company differs. Few complete the interview process with just 2 rounds, whereas with some companies you need to appear for more than 3- 4 rounds. Every organization takes their selection process in a serious way so that they can recruit the best employee for their company. Hiring a bad candidate can cost them a lot. An effective workforce is one of the vital factors for leading their company to success. It is very important to prepare all the technical concepts before you undergo an interview. For freshers, it is very important to concentrate on the basics as it would surely help them to face the interview with confidence. 1. Can you define BPO and its various types? This is a very basic question which can be asked in any interview. And try to answer it in a very simple way and smart way. The answer should be starting with its abbreviation and continue with the definition. BPO stands for Business Process Outsourcing, and basically, it is a process of outsourcing technical experts from another company for handling non-core work of the organization. It is broadly classified and people are hired for categories like administrative department, purchase department, selling department, call centre or a customer care centre, and back office. 2. What is the reason for outsourcing people from other companies? There can be many reasons depending upon the various needs of the organization like cost efficiency, to be more focused on the technical core development, in need of expertise in the non-core work, in short of non-technical staffing. This is the straightforward reason for a company to outsource people from other companies. 3. Abbreviate the following with respect to BPO terms? g) Procurement BPO – Outsourcing the procurement activities. 4. What is a voice-based BPO and a Non-Voice based BPO? Try to define this interview question for bpo, with an answer which has a definition as well as an example and then compare it. Voice-based BPO’s are the BPO’s who need to talk to the customers about the product or queries etc. People in voice-based BPO’s are mostly into sales and support. For example, the telecommunication industry is a place where people are hired for customer care which is a voice-based BPO. Non-voice based BPO’s are the BPO’s who are mainly into sourcing knowledge like gathering data for various processes. For example data entry jobs, payroll jobs etc. 5. What is offshore outsourcing, and give me an example? The process of outsourcing which has been done outside the country which is far away is known as offshore outsourcing. For example Australia outsources from India it is known as offshore outsourcing. 6. What is nearshore outsourcing, and give me an example? The process of outsourcing which has been done with near by countries is known as nearshore outsourcing. For example: When the USA outsources from Mexico it is said to be nearshore outsourcing. 7. What is onshore outsourcing, and give me an example? This is a process of outsourcing within the country, but outside the company. This is also known as domestic outsourcing. For example Indian government outsources people for passport seva from a leading consultancy in India. 8. What is a call centre and what is the difference between the call centre and BPO? Call centres are generally nothing but voice-based BPO’s. They are mainly into sales and support services. The call centre is a subset of a BPO. 9. What is the inbound call centre and outbound call centre? Inbound call centres are call centres where calls are been received on behalf of the clients. Support and customer care services fall under inbound call centres. Outbound call centres are call centres which makes calls on behalf of their client. For example, for the promotion of the product, or sales purpose. 10. What is the difference between a KPO and BPO? KPO stands for Knowledge Process Outsourcing, which deals with documentation, insurance and billing services, while BPO stands for Business Process Outsourcing which is related to customer end services. 1. How comfortable you are in handling the customers through the phone? 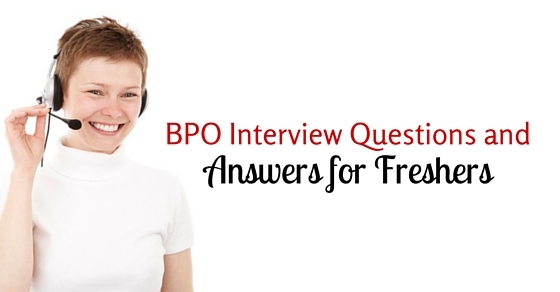 This BPO question is to know whether you are interested to handle phone calls. They might not decide whether they can give you this job, it is asked to know how far you can tackle the pressure put forward on you, even though you are not interested. 2. Why are you interested in BPO job? When these type of fresher interview questions are asked, try to talk about the growth of this industry as well as your growth expectation in this field. Justify your answer with some statistical data and some surveys. Focus on some real factors than imaginative content. This interview question can be tricky, as indirectly the recruiter might want to know how a candidate in India performs. So the answer to this question should be based on the performance of Indians in this field. For example, you can quote few characteristics of Indians which contribute to the growth of BPO. It can be like emphasizing about their communication skills, fast learners, willingness to adapt various shifts and about vulnerable to lesser wage etc. 4. Why do you want to join BPO? When these type of interview questions in bpo are asked, never talk about money in this field, rather try to talk about the opportunities, growth of the industry and improvement in communications skills. Also emphasize about the surveys, statistical data related to the growth in this industry. HR questions might not be as stressful, tricky, technical and field related questions, but it is very important as it will clearly show the person you are for this job. Here are some HR round questions and answers for freshers. This is a very common question anybody would face in any kind of interview. Make sure you answer it in a crisp way as well as in an impressive way. The main intention of this question is to make the place comfortable as well sometimes they might test the communication skill as well. So try to answer to the point and prove that you are good to speak, as it is very important for a BPO job. 2. Are you willing to work in different shifts? Working with clients in different countries means we might have different shifts, as the time zone differs. So please be clear about your preference. And also let them know if you have any medical complications with respect to working in shifts. 3. How would you rate your communication skills? Communication skill is very essential in any job profile. As far as BPO is considered, it is more important as this job requires proper communication skill. So never underestimate yourself, be polite enough and show your confidence in your voice. 4. Where do you see yourself 3 years from now? The main intention of this question is to know how ambitious you are as a person, and how long would you stick to this job. So try to show your commitment to your career by your answer. For example, you can tell you are a person who expects to be in good position holding more responsibility in your job. 5. How will you manage your accommodation? As a fresher, this question might be asked to know whether you will be able to handle things alone. So just politely tell, that might not be a problem, you will manage. This is a common question put forward to any field. But the tricky part is to answer relevantly to the job you have applied. Never exaggerate, be precise and try to answer something very simple as your strength as well as related to the job. For example, you can quote that love to speak and socialize, this might not be related to the job but it indirectly showcases your marketing ability and communication skill. For weakness, never tell something which will create an impact on your job. For example, you can tell you cannot resist traffic or your weakness for sweets etc. Feeling nervous during the interview process is a very common feeling almost everyone faces. You need to be confident while answering and overcome all such things strongly. Proper preparation and planning will surely help you crack the interview easily. What do you know about BPO and its work process? Which one do you prefer more – web or voice based on your qualification? Do you relate call centre to BPO, How? Why did you choose BPO as your career? Will you be able to do well? How? How good are you in using softwares? There are a few things that all candidates should focus on at the time of interviews. Though they may sound very simple but can surely ruin the whole process and can cost you the job. Getting a job is always easy when you know how to handle interviews with confidence. This confidence will surely come naturally when you prepare well for the interview in all aspects. Follow a proper strategy to win the game. BPO is always a boon for Indian industry, try to learn the tactics and get the right job.